The add-on allows you to precisely manage your rental rates to fit your needs. This is the second step in the rentals options during activation of your product but you can also access it at any time via the product record by clicking Edit rentals pricing. In the next window you can define several pricing rates. If you rent by the hour, you can define an hourly rental price. You can also set a different price for rentals on weekends (Saturday-Sunday). If you rent your products for whole days, select this option. You can then set the price for each day of the week. 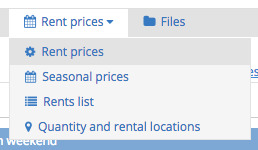 With this option, you can set a rental price for a week or month. You have volume discounts or specific packs of days or hours? Choose this option and then create pricing rules. Note: if several rates are available with a rental that you create, you will need to manually select the pricing during the rental creation. It is possible that several pricing options can apply to a rental. In this case, the system will ask you to choose the appropriate rate. Note that you cannot use mixed pricing in the same rental. You rent a bike for three hours. Your hourly rate is $20 per hour. You also have a custom "2 hours" pricing at $35. Solution 1: you rent at an hourly rate, so the rent is $20 €x3 for a total of $60. Solution 2: using the "2 hours" price. The rental will take two units of this price, $35x2 for a total of $70..
Of course, you can also define a "3 hours" price.